Ladder tags and scaffolding tags help manage the identification, safety and maintenance of ladders and scaffolding and help compliance with the WAHR (Work at Height Regulations) 2005 where there is a risk of falling liable to cause personal injury. Ladders and scaffolding all need to be checked daily at regular intervals for wear and tear, faults and damage. This is done as part of a risk assessment programme.. When the ladder or scaffolding has been inspected the inspector signs the insert if the equipment is safe to use. 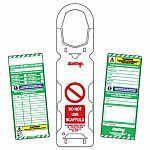 If the ladder or scaffolding is deemed unsafe for use, then the insert is removed which reveals a do not use message that is printed in red on the holder.